Doggles dog goggles are designed to protect dogs' eyes from the sun's harmful rays, flying debris, wind, rocks, or bugs. Your dog can't tell you his eyes hurt, so be proactive and help protect his eyes with these rugged dog goggles. 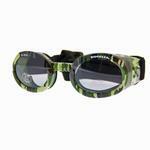 These ILS2 goggles have interchangeable lenses! These Green Camo Frame ILS2 Doggles sport a rugged look that will look great on your dog, but these dog goggles aren't just about fashion! Doggles also come recommended by Vet Ophthalmologists to protect their patients in all types of situations and also after some types of eye surgery. And don't forget that these Green Camo Frame with Light Smoke Lens Doggles are in the height of rugged dog fashion!